Besides the return of the limited-time (and amazingly awesome!) High Explosive V2 mode, week 7 of Fortnite‘s latest Battle Royale season is now chock full of new challenges! From hunting across the map for hidden locations to finding gold chests in Lonely Lodge and shotgunning opponents across dozens of matches, there’s no shortage of objectives to work towards this week for the Battle Pass crowd. This week’s primary treasure hunt challenge features something you might not expect for a spring challenge… terribly creepy laughter and some menacing hidden lawn gnomes! They may not openly mock you like the demonic living lawn gnomes from the Fable franchise, but that horrible chuckling they belt out is beyond weird and will make you want to smash them to bits with your pickaxe. Unlike several of the other treasure hunts, this one won’t have you searching random nameless hilltops between landmarks. 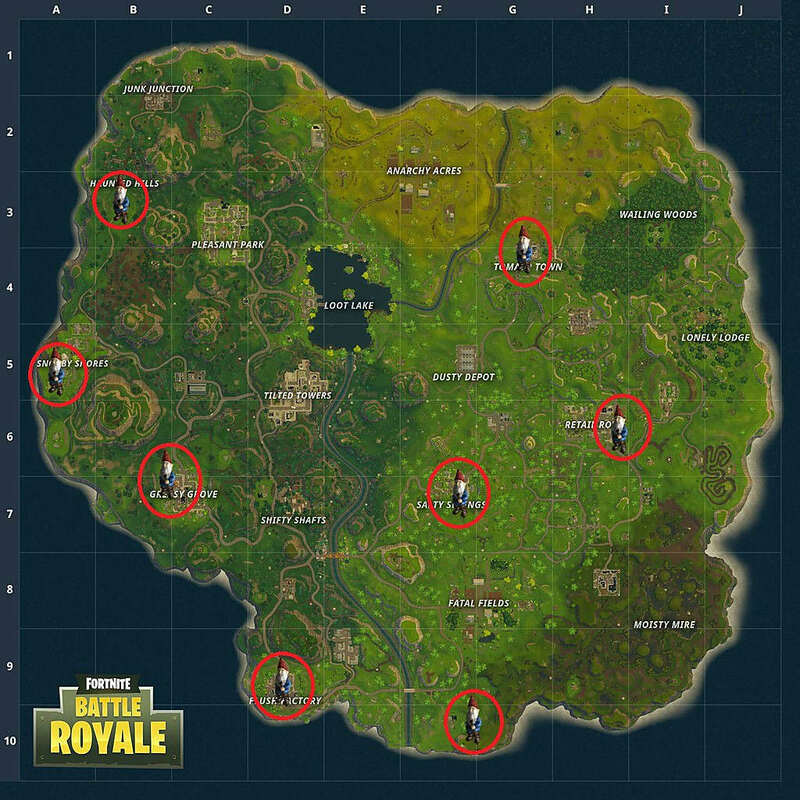 Instead, these locations are found by landing directly in major named locations like Retail Row and Salty Springs. When you land at any given named location, just keep an ear out for the laughter, as it lets you know a gnome is close. Eight specific gnome locations are marked on the map below to help you start your search (you only need to hit seven total across any number of matches). Did you find any other Fortnite gnome locations we missed? Let us know in the comments section below!